Nothing like the bullet spray from a more "familiar" aircraft. Reload your rifles, start up those propellors because the next Battlefield is rumbling towards us. With Battlefield V seemingly on the horizon, we decided to sit down and think about what we’d like to see from the next title in the seminal, spawn camping trainer. So, here we go. The Sinai Desert was a “hot” addition to Battlefield 1. One of the biggest hallmarks of the Battlefield series is the variety of multiplayer settings, through which players are set loose on barrages of multiplayer mayhem. With the next game in the series seemingly heading for WW2, the door is wide open for a plethora of map settings. Historically important battles such as Stalingrad, Dunkirk and Iwo Jima, gives DICE the opportunity to move across the globe, keeping things feeling varied. With modern technology in Battlefield 3, there came much greater opportunities for carnage! The vehicles offered in Battlefield 1 were mediocre at best. Most forms of armoured warfare were only just starting to rumble onto the frontlines and even the use of aircraft – one of the more novel aspects of BF 1’s vehicle gameplay – did not translate to the most satisfying, most tactile gameplay experience. By moving into WW2, the seamless interplay between infantry and vehicle combat suddenly becomes much smoother. Whilst the tanks offered up for use in BF 1 often spent more time as burning piles of metal (at least in my experience), the opportunity is there for DICE to utilize machines such as the Panzer, the Sherman and KV-1. All this stuff was well and good, but it didn't really change things up from previous titles. For the most part, the BF1 gameplay experience was a satisfying one. Off the warfront however, things took a slightly more frustrating turn. DICE and EA seemed to spend little time on improving the multiplayer progression system. There wasn’t enough of a focus on, and variety of, multiplayer challenges. Weekly medal lists were welcome as usual, but more of a tied in and incorporated progression system (perhaps challenges tied directly to weapons, through which players could unlock specific unlocks and skins) would make the multiplayer experience even more compelling, giving players something to aim for and then – perhaps most importantly – something to show off once they’ve achieved this aim. Forget COD Zombies. How about… Battlefield “Vampires”. Eh? 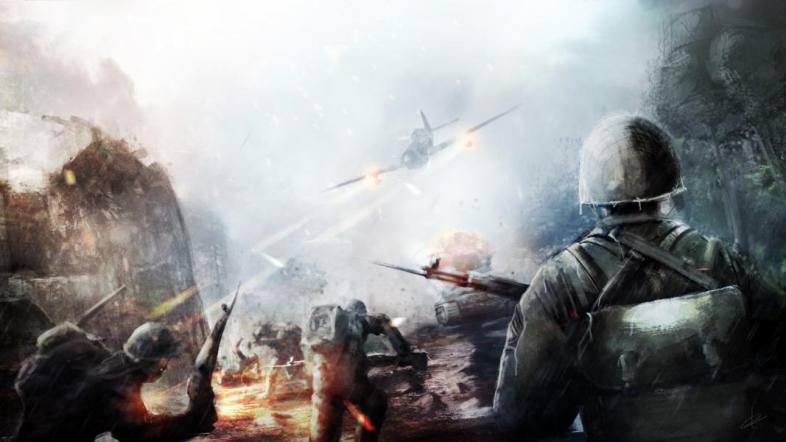 Battlefield has long been a series of two modes: single player and multiplayer. In more recent iterations, this single player portion has been given more attention than perhaps most BF fans would appreciate. For most, games in this series are multiplayer only, with any single player option often going un-appreciated until far after the games release. This isn’t necessarily the most open-minded route to take but one lacking aspect of the series – something that has pervaded for many, many games – is the absence of any co-operative mode, something that could combine the low impact of a single player campaign, with the frenetic frenzy of multiplayer. A “meet in the middle” solution. DICE could take the lead from COD Zombies and Gears of War Horde, creating replay able challenges couched with their reconstruction of WW2 battlegrounds i.e. a wave based defensive mode set on the beaches of Dunkirk, a mid-air face of in the style of the Battle of Britain, a desperate holdout against overwhelming odds fought in the ruins of Stalingrad. Luckily, something like this might be coming our way. Oh, these were the destructive days! One of the greatest joys of the Bad Company titles was the sheer level of wanton destruction players could employ on map after map. Whole buildings could be completely levelled, trapping those unknowing players inside. BF1 did have destruction elements built into its maps, but not nearly to the same extent. Structures were often left upright by indestructible walls, bunkers and foliage remained largely impenetrable to grenades and launchers. As a result, you felt less connected to the maps and more of a mere spectator, running your way through heavily designed set pieces. This simply didn’t match with the level of freedom Battlefield titles incorporate into their gameplay. Swap out the modern warfare aesthetic and you've essentially got BF1. BF1’s customisation system was mostly lifted from the likes of BF: Hardline, BF4 and even BF3. Its time for a choice of wider cosmetic options, allowing players to differentiate each other on the frontlines, showing off difficult challenges they’ve completed, number of hours played and their chosen weapons. Obviously, its important to keep these options cohesive with the WW2 setting (I don’t want to see any large “weed” leaves emblazoned on the side of a German Panzer, thank you very much) but a greater choice of customisation options would surely be a welcome addition come BFV’s release. You spend a lot of time on this screen. Too much time. This might seem like a smaller point than the rest but it’s quite key to the BF experience. Ok, I get it. With greater scope comes larger load times. This is symptom of the entire series (not just BF1) although one would think that as technology improves and as DICE continues to iterate from release to release – load times would improve at a incremental rate. But no, if anything BF1 was one of the more egregious examples in recent times, with players waiting upwards of 2 minutes for the full map to load in (I know, two minutes “it’s the end of the world). Obviously, trenches played a big part in WW1. But here they're slightly overused. This point is sort of a follow on from point number five. Battlefield is game about wide open conflicts, full of countless moment to moment skirmishes, tactical decisions, squad manoeuvres and objective battles – all of which add up to a grander vision of how the match plays out. Part of the reason for this sense of freedom is the map design. Historically, the series has always allowed players multiple points of entry to objectives, innumerable mixtures of high and low ground, interior and exterior vantage points. This was the stage upon which everything else would play out. But with BF1, things suddenly felt much more penned in. This was inherent to WW1, where trench systems and simple “forward” manoeuvres were the name of the day but when it came to Battlefield, such restrictions often made matches feel more cramped and confined, than the open gameplay fans had come to expect. Hopefully the next title can fix some of these issues and return to maps with better sense of scale, allowing for more varied match outcomes. Poor matchmaking often killed my love for BF1. I’m not the greatest Battlefield player. I’m just going to say that right here, right now. I often feel very overwhelmed as soon as the whistle blows and my squad thunders forward towards the first objective. My thumbs often direct me towards the sniper class, so that I feel like I can have some sort of impact on the match, without having to encounter players levelled into the hundreds. Call me a “virtual coward” and I would have nothing to say otherwise. Part of this is my fault but – and hear me out – part of the blame could also be levelled at the games poor matchmaking. We know Battlefield is an incredibly popular title, with the player numbers consistently in the millions. So why, with all those eager online participants, do I always seem to get matched up against players who’ve either not got jobs or play BF professionally, eight hours a day, every day of the week. As has been established, my skills are not particularly honed. But at the same time, how could they be, if my map awareness and weapon proficiency are never given time to develop before being inexplicably gunned down from every direction. This will sound bitter because I am. The games matchmaking – never seemingly based on actual player level – certainly had an impact on my enjoyment of BF1. Hopefully this is something they can improve for BFV. Empty out these crates then burn them. Battlecrates can be purchased in BF1, using the in-game currency of “War Bonds” or real money. These randomized crates offer either weapon addons, skins or XP-boosters with nothing – apparently – falling into the “pay-to-win” category. This system is now pervasive across many EA titles and multiplayer titles across the gaming spectrum. But now, after the nightmarish debacle of Battlefront 2, perhaps EA will minimize the role loot boxes will play in BFV. The common argument seems to be, that if only cosmetic items are given out through this randomized system, all bets are off. But I say no. Offering cosmetic items as something tangible, to be earned by completing a specific challenge or hitting an online milestone, gives players the carrot on a stick to be constantly chasing. This is a vital aspect of maintaining interest in any multiplayer experience and so, to have it all hidden within the dark recesses of digital boxes, diminishes any interest I may have in continuing to play, continuing to work towards specific rewards. Will EA learn their lesson? Only time will tell. Born on the online battlefields long ago, Joe sought to climb his way to the top of any leaderboard, watching the occasional foreign film, writing,and giving his dog a big hug along the way.